I found this picture today. 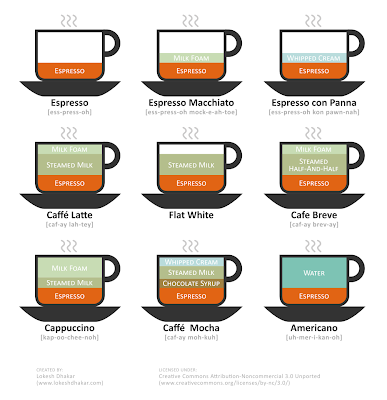 I decided to post it just in case any of you have ever wondered what exactly is the difference between a latte and a cappuccino. I've been wondering this myself ever since I first walked into a Starbucks about ten years ago. Since I didn't know the difference before today, I always just picked the one with chocolate. This is usually the Caffe Mocha. I see now, that it's the worst one for you according to the chart. But at least I leave off the whipped cream. Interesting, I never knew. This is a great chart. My fav is the Caffe Mocha too. They Have Heads and Everything!